Turn your anonymous web traffic into sales leads. Data shows buyers could be as much as 70% of the way through their buying journeys before you find out they’re interested in products and services like yours — if you ever find out at all. 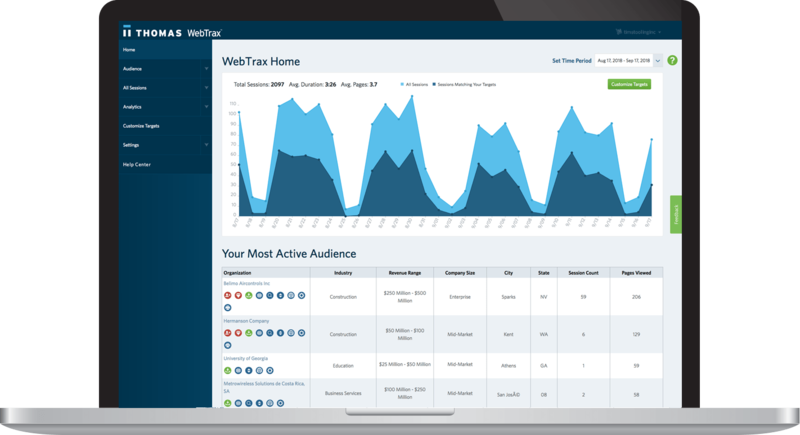 Go beyond analytics with Thomas WebTrax to see who is in-market for what you offer, how they’re interacting with your online presence, and where they are in the buying journey. Thomas WebTrax gives qualified industrial product and service suppliers access to real-time data from their website, Thomas Network profile, CAD files, and phone calls — organizing it into one comprehensive dashboard to track, identify, and engage high-value opportunities. With Thomas WebTrax, you can seamlessly follow a buyer throughout their entire journey, from the Thomas Network, to your website, to their most recent touch with your business — including an RFI or phone call. By having real-time data showing you everything from their first interaction with your online presence up through their most recent activity, you’ll never miss another opportunity. Our platform allows you to automatically define and identify the opportunities that provide the best growth path for your business, using demographic and firmographic filters to specify criteria such as industry, geography, company size, revenue range, and company name. All settings and filters are easily adjustable and update in real-time to coincide with your evolving business goals. By allowing you to see each buyer’s activity and engagement that led up to their current stage of the buying process, Thomas WebTrax gives your sales team valuable insight and enables them to craft more meaningful outreach calls. Thomas WebTrax even has the ability to feed your Thomas Network RFIs directly into your marketing automation system, to fuel your pipeline and keep your sales team busy. Choose the characteristics of your ideal customer — industry, company size, etc. Track your targets to see how they’re interacting with your online presence. See the actual buyers — not robots — with our robust filtering. Thomas provides notes on all RFIs submitted on the Thomas Network and through phone calls. Monitor the activity of your prospects as they move through the buying process. 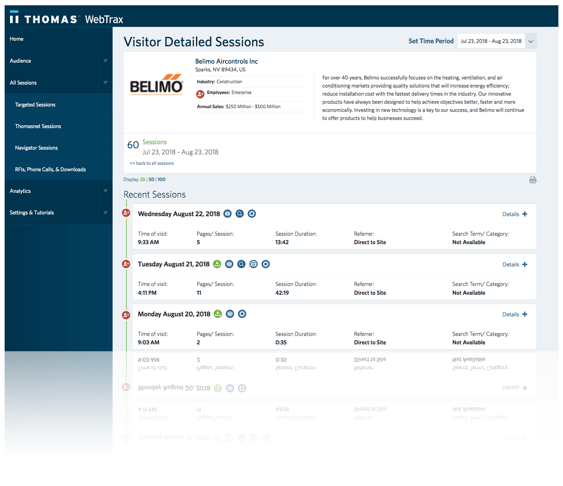 Connect the activity on the Thomas Network to your website in one seamless view. Use Thomas WebTrax to surface high-value opportunities based on the actions of in-market buyers, and engage them to drive revenue growth.